Over the last several years, since the first round of load-shedding in early 2008, the subject of electricity supply in South Africa has become very controversial. 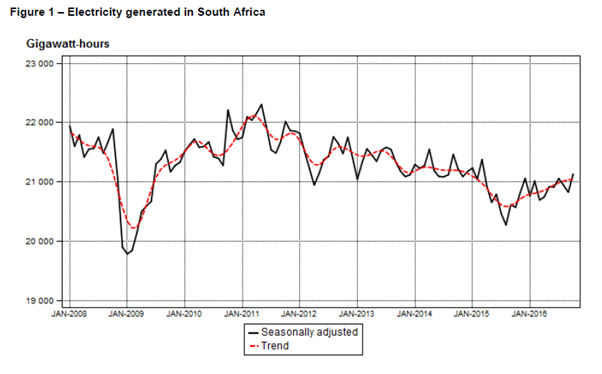 Despite recent claims by Eskom that due to good management and maintenance of plants that they have “solved” the re-occurrence of load-shedding, when in reality, they have been fortunate that the economic slowdown provided them with relief to supply less electricity as detailed in the graph below from an Oct 16 report from the Department of Statistics. The total combined renewable energy projects which have come on stream has also assisted greatly in shifting load off conventional Power Stations. The Electricity crisis is here to stay for many, many years to come and Eskom will continue to press for above inflation increases to keep it from going bankrupt and to finance new projects. Our opportunity at One Energy is to provide solutions to domestic and commercial customers to take charge of their own destiny and get their electricity costs under control. Over the period 2007 to 2015, Electricity prices increased on average by over 300% compounded, compared to a compounded inflation rate of 45%. In other words, an electricity bill of R700 per month back in 2007 has increased to more than R2000 per month today. Unfortunately, the majority of consumers still have no real understanding of how much they can expect to spend on electricity if they don’t do anything about it. Do you know how much are you really going to spend on electricity over the next 10 years? Could be as much R500k or even more!!! Given the poor state of the Eskom fleet i.e. 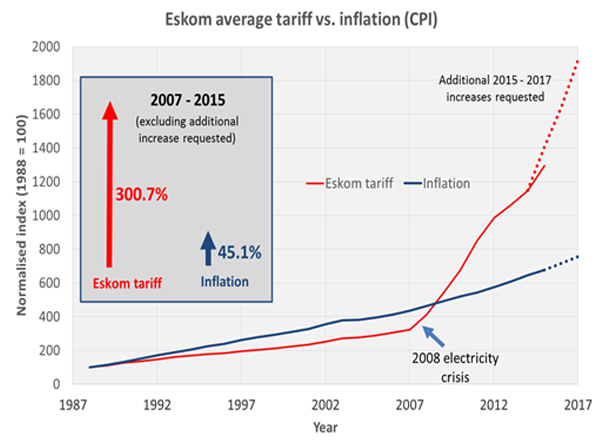 all of its combined power generating capacity, the high cost of the new power stations which are slowly coming on stream and the possibility of an ambitious but ill-conceived nuclear build programme which the country cannot possibly afford, it is very likely that for the foreseeable future, Eskom price increases will continue to be above general inflation levels.